Eight youth and two adults enjoyed participating in the All Georgia Youth Event that was held at the New Ebenezer Retreat Center. We had a total of 173 youth and adults attending from all over Georgia and filled every bed at the center! We enjoyed our guest speaker, Pastor Jay Gamelin and his unique presentation of our theme “By Faith”. The weekend was full of fun and fellowship! Wednesday, April 6th 6:00pm-7:30pm: Youth Bible Study Come join in the learning and fun! Sunday, April 10th 12:15pm-1:30pm: Carwash Fundraiser We’ll wash cars immediately following the worship service. Wear something you don’t mind getting wet! Lunch will be provided. All donations will help to cover costs for attending AFFIRM & National Youth Gathering. Sunday, April 17th: AFFIRM Registration Due See additional information below under “Summer Plan Ahead”. Wednesday, April 20th: Youth Bible Study cancelled due to Holy Week activities. Sunday, April 24th 5:30am: Easter Sunrise Breakfast Once again, Zion’s youth will sponsor breakfast following the Sunrise Service. Youth on the prep team need to be in the kitchen at 5:30am to help prepare breakfast and set the tables. Youth on the cleanup team will be responsible for cleaning the kitchen, washing dishes and setting up the education building for Sunday School. The Sunrise Service will be at 6:30am with breakfast immediately following. Saturday, June 19th-Friday, June 24th: AFFIRM at Berry College in Rome, GA See Dana Lee for registration forms. All completed forms must be returned by Sunday, April 17th with a $25 registration fee. Youth who have completed 6th grade are eligible to attend. All youth in grades 6 – 12 are invited to participate in LYO activities. For additional information contact Dana Lee Smith at 728-3227 or 665-1377. WOW! There were 45 folks playing Bingo at our March meeting, and everyone went home with at least one roll of toilet paper and/or other prizes that were given out! (Thank you to the Sisters of Faith Circle for donating 10 jars of soup mix as prizes.) Everyone had a great time winning gifts. Thank you to Charlie & Melinda Heidt, Georgia Foss, and Cheryl Pannal for the delicious meal they prepared and to those who brought food to share. Thanks also to those who helped with cleanup. At our next meeting on April 20th, Sgt. Ed Myrick from the Sheriff’s office will speak to us about the project “Lifesaver.” – (That’s where a person wearing a special bracelet can be located if they wander off.) Plan to come out starting at 11:30 a.m. to enjoy food, fellowship, and an educational program. 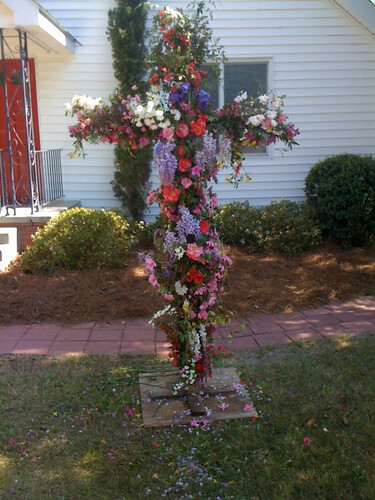 Easter morning, Sunday, April 24th, please help us decorate our “Living Cross” with fresh cut flowers. The cross will be located on the lawn in front of the church. You can bring the flowers with you to the Easter Sunrise Service, Sunday School, or the Easter Festival Worship Service at 11:00 and simply tuck them into the netting on the cross. The 132nd annual Convention of the Sunday School Association of Effingham County will be held on Sunday May 1st, at 10am with participating Sunday Schools ready to march under the tabernacle at 9:45am at the Effingham County Methodist Campground on south Laurel Street in Springfield. This is Lutheran year with Ralph Gnann of Holy Trinity Lutheran Church serving as President and Dana Lee Dasher Smith of Zion Lutheran Church is Vice-President. All Sunday Schools are welcome to participate and provide special music if desired. Following the worship service, the time will be announced for the Sunday School Association’s afternoon Business Meeting with a break for delegates to get lunch. Guest speaker for the day is The Rev. Dr. John Largen, Pastor to the Seminary Community at the Lutheran Theological Seminary in Columbia, South Carolina. As the Seminary Pastor, he offers a variety of special programs in contemplative Christian spirituality, helping ministerial candidates to make the connection between the prayerful life and public ministry. A native of Virginia, Pastor Largen was graduated from Newberry College, Newberry S.C.; Lutheran Theological Seminary, Columbia, S.C.; and the Graduate Theological Foundation of South Bend, IN, where he earned the Doctor of Ministry in Spiritual Direction. Ordained in 1980, Pastor Largen previously served The Quicksburg Lutheran Parish near New Market, VA; and then as Admissions Director for Southern Seminary. He is married to the Rev. Dr. Kristin Johnston Largen, associate professor of systematic theology at Gettysburg Lutheran Seminary in Gettysburg, PA.
Information from The Spirit Newspaper Article. Our theme this year is “SONSURF BEACH BASH.” Classes are for ages 4 (by Sept. 1, 2011) through 5th grade. Please remember to register your children for VBS and we are also asking that you tell your friends &/or bring them with you. We have a week of fun activities planned and would love to share these with the community. Forms will be placed in the rear of the Church and may be turned in to Cheryl Pannal or Teresa Sikes. We are asking for donations of the following items: Peanut Butter (creamy), Jelly, Cookies, Potato Chips/Cheetos. Please see Cheryl or Teresa if you have any questions about donating snacks. If you wish to volunteer, it is not too late. We will be setting up on Sunday, June 12th at 3 PM. The whole congregation is invited to the Friday night 7 PM closing program & hot dog supper. Please bring a food item to share that goes with hot dogs. Also, “Surf’s Up” is the movie being shown that night, planned for outside, at 8:30 PM, so plan to stay for that. Thank you, and we look forward to having a fun filled week because you know we all love going to the Beach and we are bringing the Beach to Zion with the Bible Beach Bash! Please contact Cheryl at 772-5465 if you have any questions.